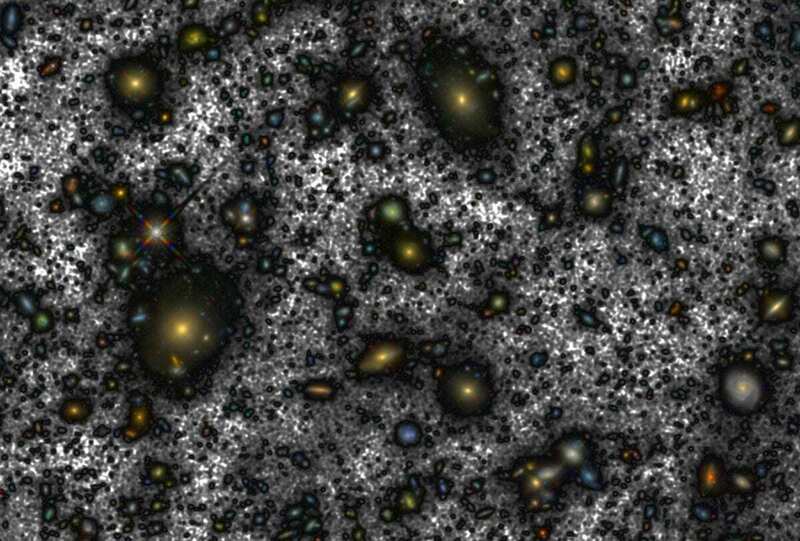 To produce the deepest image of the Universe from space a group of researchers from the Instituto de Astrofísica de Canarias (IAC) led by Alejandro S.
Borlaff used original images from the Hubble Space Telescope (HST taken over a region in the sky called the Hubble Ultra-Deep Field (HUDF). After improving the process of combining several images the group was able to recover a large quantity of light from the outer zones of the largest galaxies in the HUDF. Recovering this light, emitted by the stars in these outer zones, was equivalent to recovering the light from a complete galaxy (“smeared out” over the whole field) and for some galaxies this missing light shows that they have diameters almost twice as big as previously measured. Header Image – The new version of Hubble’s deep image. In dark grey you can see the new light that has been found around the galaxies in this field. That light corresponds to the brightness of more than one hundred billion suns. Credit : A. S. Borlaff et al.